THE GEOGRAPHY OF TONGA is made up of one fundamental principle of plate tectonics. Subduction, it is called. There is a large piece of the earth's crust called the Pacific plate that is sliding westward underneath the Australian plate. That line, going north and south, where one slides under the other is the Tonga trench, just east of Tonga. Two results of this are; uplift of the leading edge of the Australian plate, which creates all the eastern flat islands from Vava'u to Tongatapu, and a line of volcanic islands to the west, from Niuafo'ou to Ata. From Pangai harbor in Ha'apai, on a clear day you can see Tofua and Kao, the two largest volcanic islands west of Lifuka. The sight is very dramatic, as Kao appears as a perfect cone raising straight out of the ocean to a height of 3,000 ft. This is the highest point in Tonga. The volcanic soil in Ha'apai which grows such magnificent crops is the blessing from Kao and Tofua. Here is a little map of the Kingdom. There is a huge distance between Vava'u and Niuatoputapu. It's about 18 hours on the ferry boat from Nuku'alofa to Neiafu, and another 18 hours to Niuatoputapu! The Tongans there speak with a kind of a 'Samoan' accent. These "Nuias" are volcanic, along with Tafahi, Fonualei, Toku, Late, Kao, Tofua, and Ata. Pretty much all the rest are uplifted coral reefs. Captain Cook reported that Tofua was active during his visits, and it remains active today. This activity is minor, and visitors can hike on Tofua, though the area around the top of the active cone (where you can look down into the lava) is really loose and it is not recommended to hike there. There is another cone on Tofua that has an enormous lake in it. It is fresh water and makes for a nice swim, I'm told. I took a trip to Tofua in August 2007, but we were not well prepared. I fell and got injured so I didn't get into the crater to see the volcano. The problem with visiting these volcanic islands is there are no anchorages or landing places (except in the Niuas). I have heard stories about the jump from the boat onto a big rock at Tofua - not for the faint of heart and only in good weather! Mostly there is no one living on Fonualei, Toku, Kao or Tofua, but they are great places to grow kava, so the farmers go there periodically to tend their crops. Late is a nature preserve for the rare Megapode, a bird which incubates it's eggs in warm volcanic soil, so people are forbidden there. 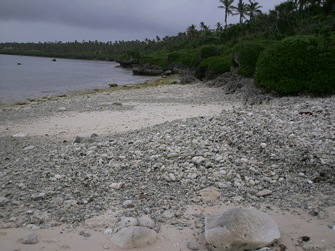 This is the shore east of Pangai on Lifuka. The prevailing winds come from the east, so mostly no one lives on this side. You can see this huge pile of shells and coral rocks that have collected in this pocket at the south end of the beach. About a hundred meters out is the reef where waves are constantly crashing, just like in that Tom Hanks movie. You can pick up lots of very beautiful shells here, but watch out for the poisonous cone shell. The live ones have a little harpoon they can shoot out at you and it can kill, so I've heard. There's lots of little hermit crabs, the mascot of the Wesleyan schools. 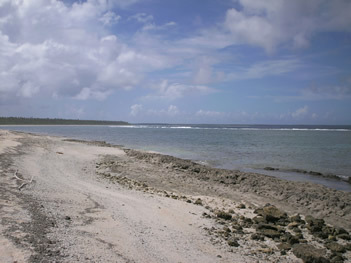 Here's a view of the eastern shore of Lifuka looking to the north. There's a series of coral benches being shoved up out of the water by the action of the tectonic plates below. You can clearly see the line of surf at the edge of the reef out there. The next island to the North is Foa, and it is connected by a causeway you can drive across. Ah, just another day in paradise. I loved to walk over to this beach just to get away and have a little excercise once a day when I lived in Ha'apai. The next island to the east is Niue (not to be confused with the Nuia's of Tonga), continuing east are the Cook Islands and French Polynesia, with Tahiti about 4 weeks by sailboat because it's against the wind. 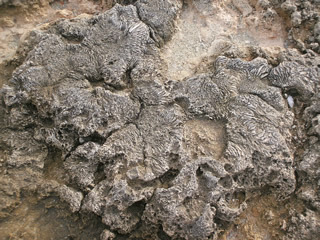 Here is a closer view of the coral rock that makes up, well, pretty much everything in Tonga! Coral is a tiny organism that pulls calcium out of the water to make it's home, then puts on the dinner napkin and starts eating even smaller things. Actually most corals have a partnership with a dinoflagellate algae in their tissues that provides a free lunch via photosynthesis. Give it a few billion generations and you have a nice island for us to live on.